On Jan. 26 2015, former schoolteacher Moussa al-Zahrani likely spent much of his morning alone in his jail cell. If he had not already stirred by sunrise, he would have been awoken by prison guards – though he was almost certainly restless due to what awaited him. At that point, he was served his final breakfast and, if he was exceptionally lucky, was slipped a sedative to relax him. Al-Zahrani had been convicted of sexually assaulting children in the Kingdom of Saudi Arabia, America’s closest Middle Eastern ally apart from Israel. Despite protests from human rights organizations asserting that a great deal of the evidence against al-Zahrani had been falsified, his execution by beheading was only a matter of minutes away. Following morning prayers, al-Zahrani was quickly taken from his cell in the city of Jeddah, handcuffed and blindfolded, to his ultimate resting place in an effort to beat the stifling desert heat. In Jeddah, the location is a central square in town, though it lacks the notoriety of Riyadh’s Deera Square, better known by the surrounding citizens by its more ghoulish sobriquet “Chop Chop Square”. When he arrived at the town square, a crowd undoubtedly gathered. English writer John R. Bradley wrote in his book “Saudi Arabia Exposed: Inside A Kingdom In Crisis” that in this particular area, “executions are the only form public entertainment…apart from football matches”. He would then be led to the earthy patch in the center of the square. According to Muhmmad Saad al-Beshi, a prolific executioner notorious for allowing his seven children to clean his sword following an execution, it is at this point that the prisoner will acquiesce to the events occurring around him due to a combination of exhaustion and fear. After all of the preparation has occurred without disturbance, as it did for al-Zahrani, death arrives swiftly for the condemned. “The head, upon detachment, appears to pop off the body, as with a doll that has been squeezed too hard”, wrote Janine Di Giovanni in Newsweek. For many, however, the celebration of their death does not end once their head has been removed. A loudspeaker announces the crime for which the deceased has been executed, at which point people begin to applaud. This macabre practice is nearly identical to the handiwork of the brutal Islamic State. However, Saudi Arabia, as one of the United State’s premier sources for crude oil and a widely cited asset against the war on terror, remains one of America’s closest allies. So close, in fact, that President Barack Obama deplaned the day after al-Zahrani’s execution. Long before the attacks on Sept. 11, 2001, but especially since their occurrence, the relationship between the United States and Saudi Arabia has been one of the more complex around the world. Osama bin Laden and 15 of 19 hijackers responsible for the attacks were Saudi nationals, initiating an enormous amount of American backlash against Saudi Arabia. A 2002 report on terrorist financing conducted by the Council on Foreign Relations, an American non-profit think tank that has had more than a dozen Secretaries of State and numerous other high-level politicians on its board, found that “individuals and charities based in Saudi Arabia have been the most important source of funds for al-Qaeda. And for years, Saudi officials have turned a blind eye to this problem”. Animosity toward the Saudi Arabians over this issue has persisted even to present day, as recent reports by CNN have been championing new allegations that members of the Saudi royal family supported al-Qaeda. In a sworn statement, Zacarias Moussaoui, the man frequently described as the 20th 9/11 hijacker, claimed he was tasked by Bin Laden with creating a digital database of al-Qaeda’s donors. According to Moussaoui, individuals such as Prince Turki al-Faisal Al Saud, the former director-general of Saudi Arabia’s Foreign Intelligence Service and ambassador to the United States, appeared on that list. Max Rodenbeck, writing for the New York Review of Books in 2004, concluded that the American public and political system had a mental image of Saudi Arabia as a sort of “oily heart of darkness, the wellspring of a bleak, hostile value system that is the very antithesis of our own. America’s seventy-year alliance with the kingdom has been reappraised as a ghastly mistake, a selling of the soul, a gas-addicted dalliance with death”. The relationship became so strained that, according to the Washington Post, a stunning proposal was made by the RAND Corporation, a prestigious think tank financed by the United States government, to the Defense Policy Board, an arm of the Department of Defense. In the proposal, it was suggested the United States should consider “taking [the] Saudi out of Arabia” by forcibly seizing the oil fields and delegating control of the holy cities of Medina and Mecca to a multinational committee of moderate Muslims. “Saudi Arabia supports our enemies and attacks our allies”, argued Laurent Murawiec, the presenter of this idea and a protégé of Richard Perle’s, an advocate of war with Iraq who chaired the Policy Board. “The Saudis are active at every level of the terror chain, from planners to financiers, from cadre to foot soldier, from ideologist to cheerleaders”. He went on to describe them as “the kernel of evil, the prime mover, the most dangerous opponent” in the Middle East. Sentiments of intense hostility were just as prevalent in Saudi Arabia. A survey taken by the Saudi intelligence service of “educated Saudis between the ages of 25 and 41” taken during Oct. 2001 found that “95 percent” of those surveyed supported the actions taken by Bin Laden. Even the Saudi Minister of the Interior, Prince Nayef bin Abdul-Aziz Al Saud, repeatedly insisted that the Saudi hijackers from 9/11 were merely dupes in a Zionist plot to incite hatred against Saudi Arabia. On Oct. 2, 2002, with tensions at an all-time high, President George W. Bush and Congress agreed on the joint resolution authorizing the Iraq War. It was under that context that a young, fresh-faced man who was a few months away from announcing his first campaign for the United States Senate stepped to the podium in front of the first high-profile anti-Iraq War rally in Chicago. The fiery conviction with which Barack Obama delivered these remarks serve only as a reminder of the naïve idealism that marked his earlier political career, a relic that President Obama likely no longer remembers as he is forced to deal with the complexity of our relationship with Saudi Arabia. 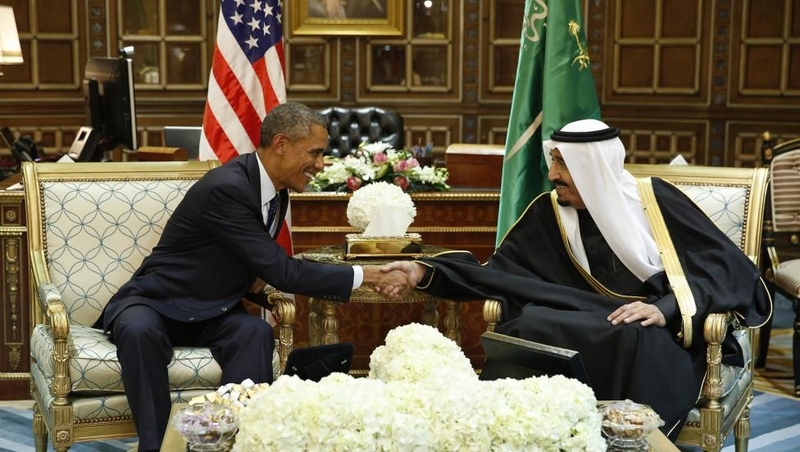 After the death of King Abdullah of Saudi Arabia on Jan. 23, 2015, it was announced that President Obama would be visiting the country to pay his respects to the leader he praised, mentioning specifically “the importance of the U.S.-Saudi relationship as a force for stability and security in the Middle East and beyond”. To the United States, Saudi Arabia is a key ally. So key, in fact, that the Obama administration has taken great lengths to assure the Saudi leadership that they are working together. Obama acquiesced to Saudi interests in regards to Egypt’s post-revolution political shift and the two are currently working together on combating the Islamic State as the group pushes toward the Saudi Arabian border. The United States and Saudi Arabia have also worked together recently to plunge the price of oil, thereby tanking the weak oil-based economies of Russia and Iran. The move boosts both countries’ economies and severely weakens two of their biggest foes. It is a move of economic clout, showcasing just how powerful the U.S.-Saudi friendship is on the global stage. It is for this reason that issues of human rights in Saudi Arabia have been set firmly on the back burner by the United States. In the wake of the Islamic State’s rise and the Charlie Hebdo attacks in Paris, the Saudi kingdom has received a great deal of scrutiny for their harsh and brutal retribution against criminals and political dissidents. Blogger Raef Badawi, for the crime of insulting Islam, was sentenced to 10 years in jail, fined $267,000 and ordered to receive 1,000 public lashes. A recent article in the Washington Post compared the legal punishments doled about by Saudi Arabia with those administered by the Islamic State. The results were shockingly identical. For simple theft, both will amputate the hands and feet of the thief. For adultery while married, the punishment is death by stoning. For blasphemy, acts of homosexuality, treason or murder, the sentence is death, typically by beheading. Both the Islamic State and Saudi Arabia are governed by strict interpretations of Shariah, the legal code of Islam based on the Quran. The obvious major distinction, however, is that Saudi Arabia is a close economic and political partner. It is for this reason that the Saudis do not have the president blasting them for what he said were “barbaric” punishments when the Islamic State performed them. Before making this latest trip to Saudi Arabia, President Obama acknowledged it’s human rights record and, far from the idyllic rhetoric from 2002, asserted that America would have to overlook it for the sake of politics. “Sometimes we need to balance our need to speak to them about human rights issues with immediate concerns we have in terms of counterterrorism or dealing with regional stability,” he told CNN. The idea is not new, but the increasingly complex relationship between America and Saudi Arabia, as well as the willful ignorance toward their human rights policy only serves to drive home the fact that modern political strategy does not allow for idealism or helping people. It merely permits or, in some instances, limits those in power to striving to protect national interests and nothing more. Click here to see BBC’s video on Saudi Arabia.